It all started with a simple single piece plastic wrap around iPhone stand. The stand was available through Kickstarter, making it easy to mount the iPhone to a tripod for those low light or self shots. The mount, The Glif, was created by Studio Neat. Since then, the team has introduced updates to the month, an big hands stylus, and even square ice cubes. Finally, iOS software. The first app was a stop motion photography app, Frameographer. Today, I received an email to enable more creative movie creation on the iPhone. Slow Fast Slow starts off by recording video at 120 fps on the 5s, and 60 fps on the rest of the newer iOS devices. 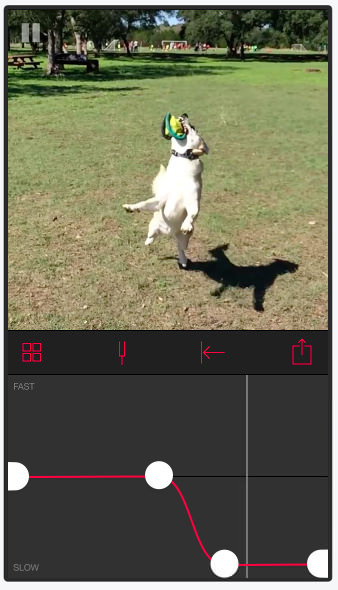 Playback can be slowed down to 1/8 speed, which is twice as slow as the 5s built in slo-mo. Well, I know I personally have played with other slow motion apps, so that just slowing down my video isn’t that ‘new’. But, further investigation explains the name, Slow Fast Slow. Which references the apps unique power to have full control of every part of a video’s speed across any portion. When viewing a video (forward or backward), any part of the video can be slowed down a little or a lot. Imagine a video of a car zooming by, normally you have either a car streak by or take forever to get to the closest view in slow motion. Now, just choose the part when the car is closest and show down at an increasing rate till you can see the driver and car details, then speed up to zoom off. As an added bonus in Slow Fast Slow, the audio of the slowed down portion of the video doesn’t get highly destroyed like found in normal slow motion movies. There is Pitch control to level out the fast and slow bits of the video.